While we have the chance, allow us to tell you more about the Shiba Kōkan painting now on display in Shirokane. This is thought to be a work of the early Kansei era (1789 - 1801), and was perhaps based on a European print or engraving. 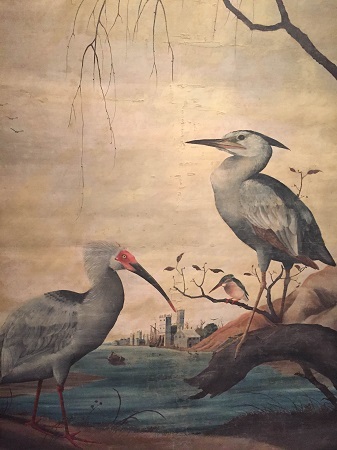 Beyond the three birds in the foreground, you can see an urban scene reminiscent of an Italian town. We can sense in this work the strong interest Kōkan had in things European, which were largely new to Japan at the time. Unfortunately, this work will only be on display until Wednesday June 10, so by all means please make the time to come and see it while you can! 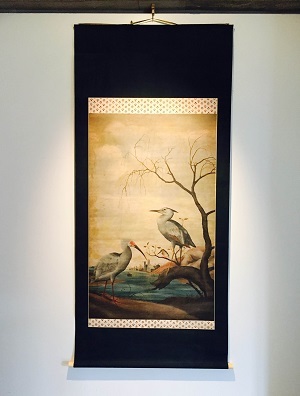 Other than those in Kōkan's painting, flowers and birds can be found adorning the wall of the tokonoma as well. This is a fragment of a version of the Lotus Sutra popularly known as the Chōtori shitae kyō, or "Sutra with Butterfly and Bird Underpainting", because of the decoration found largely in its upper and lower borders. 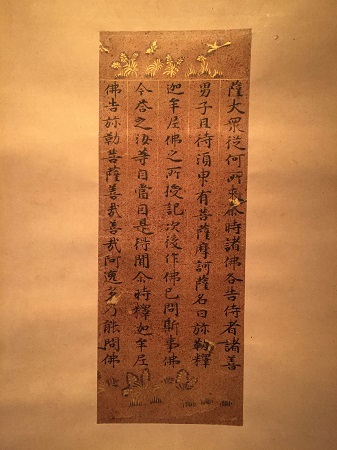 The Lotus Sutra is the only Buddhist scripture that states women can achieve Buddhahood, which is perhaps why the paper this version was brushed upon came to be so charmingly decorated. These and a variety of other beautiful flowers and birds await, so we hope you will stop by the gallery soon.